Pumpkin Pancakes: Want to start off the day with a tasty pumpkin twist? Add extra flavor and nutrients to your breakfast pancakes by stirring canned pumpkin into the batter. Kefir Pumpkin Pie Smoothie: With more strains of good-for-you probiotic bacteria than most yogurts, the fermented milk product called kefir is a great start to any day. Its tart flavor makes it a natural for pairing with sweet fruits like pumpkin or berries. 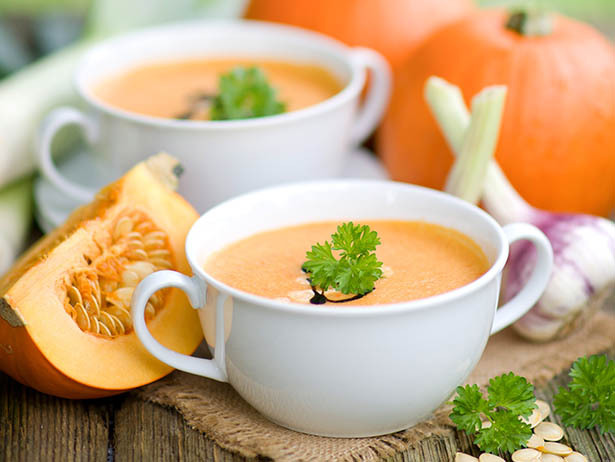 Autumn Pumpkin Soup: Celebrate the fall harvest season with this quick and easy creamy pumpkin soup flavored with brown sugar and nutmeg. Classic Pumpkin Pie: It wouldn’t be the holidays without the quintessential pumpkin pie on the dessert table. This one uses whole milk for an added creaminess. Serve with fresh whipped cream or vanilla ice cream. Pumpkin Bread Pudding: Canned pumpkin puree and milk make this holiday bread pudding both moist and flavorful. Pumpkin Cranberry Bread Pudding: Put a spin on traditional pumpkin bread pudding by adding cranberries into the mix. Soak up the flavor of cranberries, spices and pumpkin with this golden-crusted bread pudding. However you choose to celebrate the holidays, make sure to get the nutrients your family needs with real dairy. With 8 essential nutrients and 8 grams of protein per serving, milk is a refreshing and healthy way to wash down your holiday meals. Nothing pairs better with sweet pumpkin than dairy!